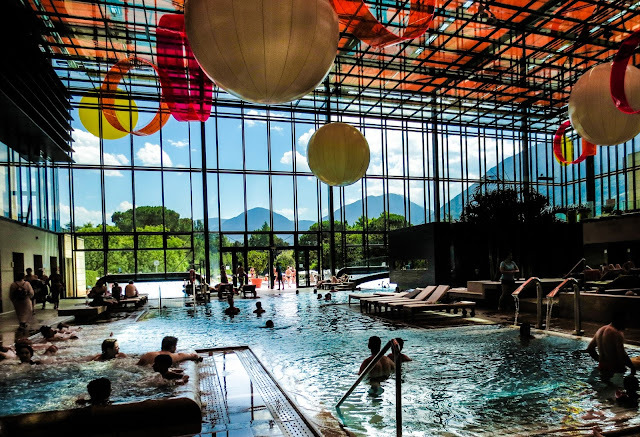 One of my birthday gifts I ever wanted: Therme of Meran! 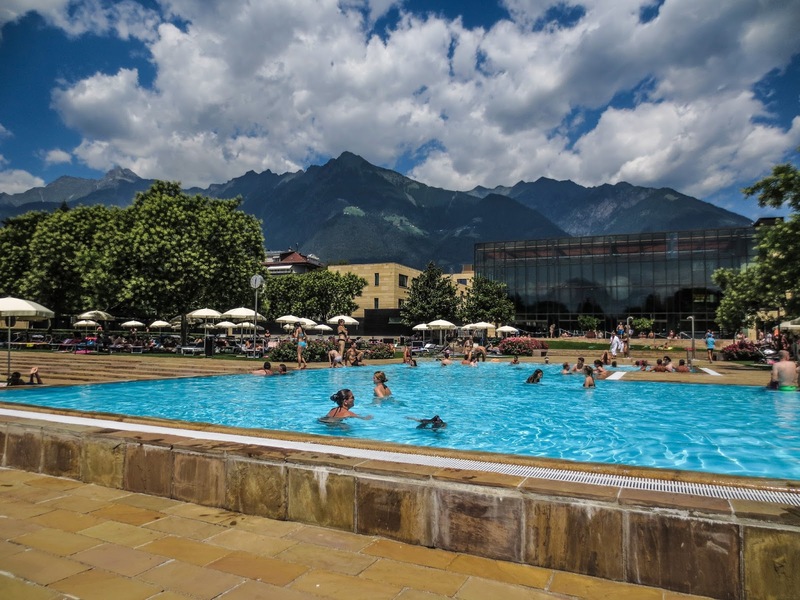 They are located in the middle of the Merano town, an entire area dedicated to leisure, wellness and relax. We parked our vehicle in the awfully expensive car park right underneath and went up to the therme by stairs. Somehow we already knew there was a discount for the ones headed to the therme so we remembered to tell the staff we have parked down there and in fact we got the day’s parking for 10 euros instead of 20 or whatever. The customer service seemed to me colder than in the other spas where I have already been in the past. They gave us no direction on where to go or, advices on lockers, showers and etc. It have been in fact little bit confusing at the beginning, it was not intuiting at all and we saw people wandering around and asking others. If you are going there for the first time you need some minutes to realize what doing first. At the reception desk after we have paid our tickets, we got a wrist tag watch which gave access to the lockers in the large unisex locker room. I didn’t pay my ticket as it was a gift but I saw that there were several ticket options, varying by time and combinations of guests. We have taken the towels from home so we didn’t pay for it; they need to be rented on a separate place with separate payment, better having your own one. There was a gift shop at the entrance with a wide selection of swimsuit, bathing caps, slippers and magazines, in case you forget something you can easily buy it there. As soon as we understood the method everything became easier: changing rooms, lockers and showers were then simple and efficient. Once got ready with our swimsuit we entered in to the spa area: they had a selection of indoor and outdoor pools of all temperature clearly labeled, mineral bath, sauna, Turkish bath, spa treatments and so on. The locations was stunning, the surrounding mountains gave an additional touch to the location. It was crowded but that was not disturbing us because the complex was very big and there were plenty of things to do. Modern, comfortable clean and well maintained. It was perfectly planned to entertain families, couples and singles. Nothing was missing! We stayed in the outdoor complex in the morning and we moved to the indoor area after having our lunch at the self service restaurant bar for a reasonable price. All our extras were charged on the wrist tag watch which we settled down at exit. The food was quite good as well. The indoor area is divided into the naked and the non-naked sections. Obviously children under 14 have no access to the naked area. In case parents want to relax without them there was a kid drop off service for an extra charge of course. I don’t agree with their photography policy, once inside you can’t take a single photo, if you try to take one you will be aggressively told off. I have been able to stole some shots. The staff inside acted more like controlling police instead of informing guides, so you better pay attention and follow the rules. Most of the outdoor pools are told to be closed in the cold seasons but it is also said that the amazing experience is given during the winter when you’ll see the surrounded mountains covered of snow while swimming in the outdoor hot water pool. I came to know later on that there was a salt water pool with underground music! It would have been a great experience. Sadly we missed it. In essence it has been a positive experience which we highly recommend for everyone. You can’t go wrong spending some time here!!! The location of the pools is so gorgeous! It's a shame you didn't have such a good experience with the staff. I may have to add Merano to my list for the next time I'm in Italy. Oh my word, would have loved to see more pics of here, but a pool with a view of a mountain! I want to be there now!